An online community platform, which offers message board, forum, BLOG and other online interactive tools, as well as Expo Shanghai Online search and online help functions to enable a better and easier experience by visitors of Expo 2010 Shanghai China. The base platform for Expo Shanghai Online is constructed by the Organizer and offers both Chinese and English versions. Built on the basis of the base platform, the Expo Shanghai Online pavilion, featuring a combination of the online virtual display of the physical pavilion and the online virtual exhibition space, falls into the following two types: Browsing Pavilion and Experiencing Pavilion. The Browsing Pavilion is a basic online pavilion that enables online visitors to access through its 3D browsing function an all-round view of the spatial layout and main contents in an online pavilion, and to have a vivid and visual experience of the exhibited items through texts, photo images, audio, video, and animation. 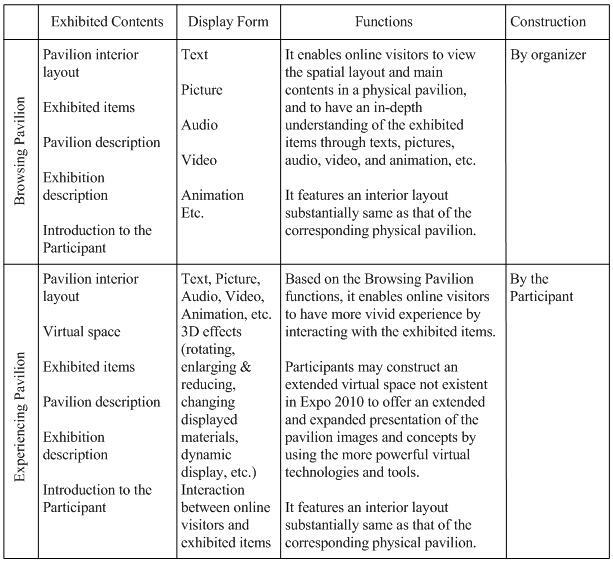 The Browsing Pavilion features an interior layout substantially same as that of the corresponding physical pavilion. The Browsing Pavilion offers both Chinese and English versions. The Experiencing Pavilion is an enhanced online pavilion that enables online visitors to roam in the online pavilion and thus have an in-depth understanding of the exhibited items through texts, photo images, audio, video and animation, and technologies such as 3D display and virtual reality. It also offers real-time interaction and other customized functions to provide a more vivid and lifelike experience for online visitors. The Experiencing Pavilion may contain an interior layout substantially same as that of the corresponding physical pavilion, while Participants may construct an extended virtual space and display additional exhibited items to offer an extended and expanded presentation of the pavilion images and concepts by using the more powerful virtual technologies and tools. The Experiencing Pavilion offers versions in three languages: Chinese, English, and an official language selected by the Participant. With a history of over 150 years, the World Expo has always been presented through exhibitions and displays in physical pavilions, uniquely featuring a wide and extensive distribution of pavilions, a huge variety of exhibitions and displays, and a long period of running time. Therefore, it is not appropriate for the World Expo to be intensively and continuously live broadcasted via television coverage. With the swift advancement and increasingly popular application of new communication technologies, especially under the influence of internet technology, the wave of information technology is sweeping across every corner of the world, which has brought to the World Expo unprecedented opportunities and challenges. To explore new and innovative ways of presenting the World Expo in an age of information by optimizing the unique advantages of internet technologies, the Organizer will launch a creative program of Expo Shanghai Online in addition to hosting the physical Expo 2010 Shanghai China. Featuring a joint participation by the Expo Organizer and participants, Expo Shanghai Online will present by using internet technologies an online version of Expo 2010 Shanghai China featuring a combination of virtual presentation and reality, thus creating an internet platform enabling alternative experience and real time interaction, in addition to other supportive functions. As an integral part of Expo 2010 Shanghai China, Expo Shanghai Online serves as an introductory channel, supplement and extension to the physical Expo Shanghai. Stage One (2007): Planning – preparation, verification and approval of the master and technical plans. Stage Two (2008-2009): Participation Organizing, and Development and Construction – confirmation of participation, and building of the base platform and key pavilions for launching the full development and construction. Stage Three (2010-): Operation and Maintenance – operation, maintenance and management of the platform of Expo Shanghai Online. As a creative innovation to the traditional way of presenting the World Expo, Expo Shanghai Online enables online visitors to interact with the Organizer and the Participants to satisfy their different needs and personal interest, increases the global coverage of the World Expo, and attracts more visitors to the physical Expo site or provides an opportunity for those who cannot make it to the physical Expo site. In this way, it helps to enhance the international impact of the World Expo by promoting the World Expo concepts and presenting the social, scientific, historic and cultural information concerning the Participant in a wider scope and for a longer period. The online Expo will enable Expo 2010 Shanghai China to become an everlasting World Expo. It will powerfully enhance the publicity and ticket sales of Expo 2010 Shanghai China, and the promotion of World Expo concept, through an effective use of the internet capabilities featuring no limitation in time and geographical boundaries. Meanwhile, the Participant may also present and promote its image and participating philosophy online to the general public of its nation. It will allow online visitors to have a visual, vivid and complete understanding of the Expo Site covering an area of 5.28km2, and the pavilions of over 200 participating countries and international organizations covering an area of 850,000m2, and help visitors to better understand the Expo Site and its peripheral areas, available service facilities, public transportation and visitor traffic for a more targeted planning and scheduling. It will offer, through online browsing, multimedia display, interaction and other internet tools, an introduction to the knowledge about and concepts of the World Expo, as well as the social, scientific, historic and cultural background of the Participants and their exhibitions and events, along with relevant information and visual images to fill up the gaps between different languages and cultures, time and space, and to provide a beneficial supplement and extension to the physical Expo Shanghai. It will present, through an integration of internet technologies including 3D virtual reality, a vivid online illustration of the best contents in the Expo Site and pavilions, thus creating an exhibition platform that enables alternative experience and real time interaction between the real Expo site and the online exhibitions, and enhance the coverage and impact of the promotion of World Expo image and concepts in a more extensive and lasting manner. Expo Shanghai Online is accessible through two portals: one under an independent domain and the other under a second-level domain linked through the Expo 2010 official website. Expo Shanghai Online consists of the base platform and the online pavilions.